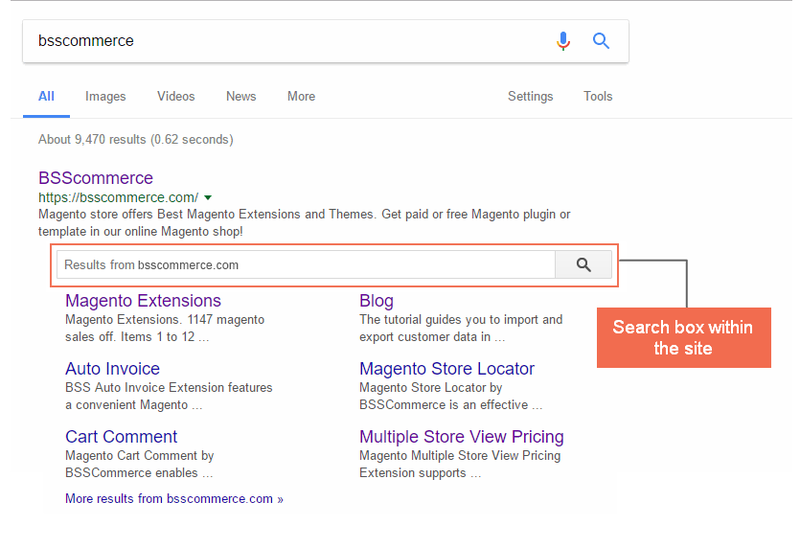 Magento 2 Rich Snippets add Rich Snippets, breadcrumbs, rating, price, review… for products and other information of your Magento 2 store in search result pages. Display Rich Snippets (price, rating, review, availability) for product and category pages. Enable breadcrumbs (show navigation path) for better displaying in search result. Show Rich Snippets for business information (name, logo, contact, social links, etc..) on SERPs. Enable a specific search input box for your Magento 2 store. Support Open Graph and Twitter Card for sharing on social networks. Checkout Magento 2 SEO Extension - all SEO tools you need for only $119! Rich Snippets in Magento 2 is a kind of additional information about your website which you provide for the search engine crawlers like Google or Bings. These information described in formed of structured data markup will be shown in a more appealing display of your Magento 2 store and its products in search result. Magento 2 Rich Snippets Extension is the perfect choice to get all Rich Snippets you need with just a few clicks! Instead of the regular uninviting product descriptions in the search results, Rich Snippets in Magento 2 enhances your items with an attention-catching display to customers. Product price, rating, review, in stock/out of stock status, all will be shown in the SERPs. These rich snippets will give buyers a good overview of the product and trigger them to click in. In general, the URL paths are be shown under the product or category name in the SERPs. With Magento 2 Rich Snippets breadcrumbs feature, those URLs are replaced with a clear navigation path. This feature of Rich Snippets aims to a provide user a precise look about the product and where it belong on a complex massive Magento 2 site. Buyers usually search for the seller information before making the purchasing decision. Hence, supported with rich snippets in Magento 2, your store will be shown on the SERPs with the most detailed information. In the backend configuration of Magento 2 Rich Snippets module, admins can add name of the business with contact info (phone, email, address), logo, social links. Your brand awareness is now highlighted and leaves an unique impression on customers’ mind. 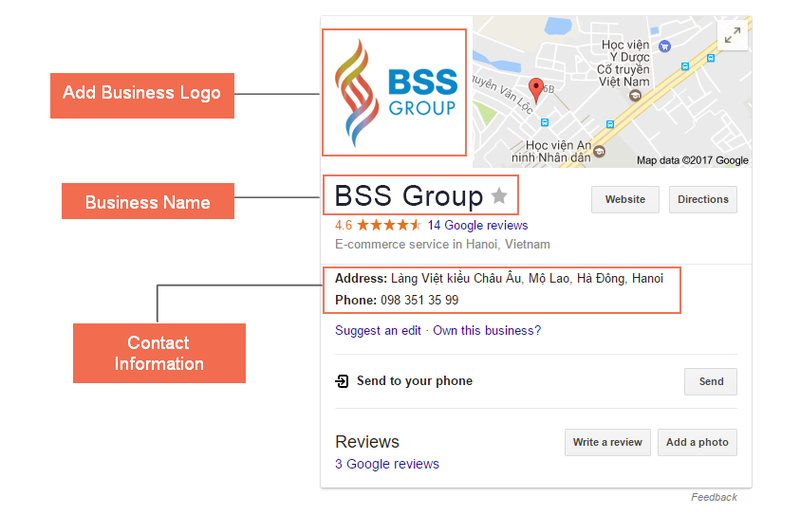 Once your business name is entered on the search box, the first result will be displayed with another smaller search box. It is an advanced feature in Rich Snippets Extension where the search box can be used for searching within your Magento 2 store. Magento 2 Rich Snippets Extension also supports a better sharing of links from your store on Facebook and Twitter. 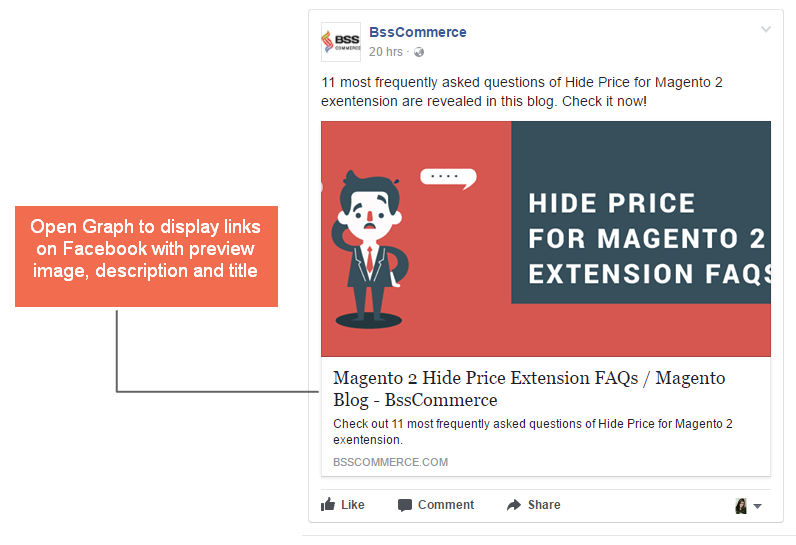 Instead of the URL text only, your content will appear on Facebook and Twitter with a preview of title, description and images. All you need to do is setting on Magento 2 Rich Snippets backend and all the work will be done automatically. Magento 2 Rich Snippets Extension provides Google and other search engines more trustful information about your business and your products. Hence, it will be considered for a higher ranking on search result. A higher ranking leads to a raise in traffic. Moreover, the Rich Snippets with more information about product such as price, review, rating,..will create a certain trust and curiosity for buyers and trigger them to click on your site. The search box feature and other additional information through rich snippets will give user a more pleasant while searching for the product and approaching your Magento 2 store. Following your Magento 2 Rich Snippets user guide, I can easily generate different snippets with company information, breadcrumbs, customer review, and price, etc. As a result, my site is displayed better on SERPs. Thanks a lot! This is the second module I got from BSS. Fantastic features of Rich Snippets! Highly recommend this module for any Magento 2 store owner. Rich snippets is a must and the first thing to start with if you want to do any SEO for your store. Reasonable price and you get many great features.